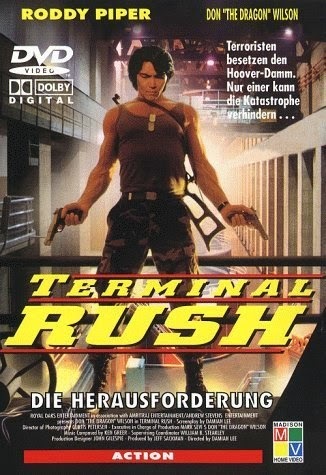 Terminal Rush is a scraggly straggler in the unending 90’s parade of “DieHardInA” movies. Ironically enough, the long list of such films is interminable indeed. And this ranks towards the end of the pack, if we may mix a metaphor. While the opening of the movie is highly ridiculous and funny, with government officials spitting out random nonsequiturs in between credit titles, while throughout the whole sequence, a big, framed, centered picture of Bill Clinton beams out at us, the audience. So far, so silly. But then it takes a turn for the mediocre, with tons of mindless shooting between no-one-knows-who, and instead of an abandoned warehouse, it’s the inner workings of the dam, which looks exactly the same. The whole look of the movie is drab and washed-out, in typical Damian Lee style. He’s not reppin’ Canada properly. And we’re not even Canadian. So why do we keep watching these things? Because we think our cinematic heroes, Don The Dragon and Roddy Piper will save us. Granted, Roddy plays a rare baddie role here, but you get the point. In classic fashion, Don’s character, Harper, is ex-Special Ops, ex-Special Forces, and “if anyone can save us, he can”. But, as we alluded to earlier, he does more shooting than Martial Arts, which was a disappointment. His minority Indian status allows him to get away with moments like: after he beats up/kills a baddie, his one-liner is, and we quote, “That’s a dreamcatcher”. If you didn’t just groan, feel free to do so now. Viewer warning: it doesn’t get any better from here on out. Yes, the movie is startlingly dumb, but it does have Roddy wearing bizarre eyeblack throughout the entire outing, which can be seen on the box cover. It truly is the original guyliner. Just why he wears it - and why he wears it for the entirety of the movie - is never explained, but our introduction to it is lifted from a gag from Airplane! (1980). Roddy can pull it off. The gag, not the eyeblack. Meanwhile, there’s a Black guy named Snookie (Warren). Truly he’s the original Snookie. The Jersey Shore cast members must be huge Terminal Rush fans. And what could be more apt than naming a little orange moppet after a strapping Black gentleman? Plus his voice sounds exactly like Samuel L. Jackson’s. If you ever wished Jackson appeared in Terminal Rush, just close your eyes during Snookie’s scenes. You’re not missing much anyway. Sadly, a few silly beat-em-up scenes, an exploding helicopter, and Roddy Piper with a missile launcher can’t distract from the fact that the whole endeavor lacks interest or suspense. But it does have one of our favorite items, repeated footage. Apparently some goons walking down steps while shooting machine guns was deemed so amazing, we had to see it multiple times. 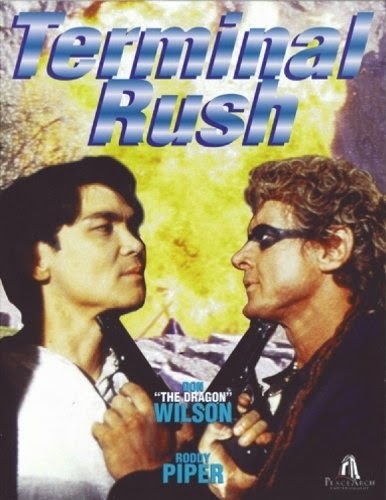 Featuring the typical 90’s word Terminal in the title (see our Terminal Justice review for a more detailed analysis of this phenomenon), this Terminal Rush is a terminal bore. I think Damian Lee is a pretty good director, of his filmography I also enjoyed "A Dark Truth", "Breakout", "Sacrifice", "Agent Red", "When the Bullet Hits the Bone", "The Donor", "Street Law", "Fatal Combat", "Abraxas" and "Food of the God 2"
Never noticed the repeat footage. The only film I can think of where I saw that was a film called American Commandos, which accidentally used the same reel of footage twice on one video release(the Avid Video one, though the Lightning Video version does not have that mistake). P.S. Did you see "John Wick"? It was a really good old-school style action film, I think you'd really enjoy it. So is this the Terminal week? What's next? Terminal Velocity? Terminal Force? Surely not The Terminal! Venom: Our American Commandos review also caught the repeating footage. We love repeating footage and yes we saw John Wick and enjoyed it. What do you think? Roger: You hit the nail on the head about the Canadian production look. Spot-on comment as always. At some point in the future, we will post Terminal Velocity, but we love "Terminal" movies so much, we couldn't wait so we only have two this week. Rest assured, Ditch Brodie will on this site and not Tom "Larry Crowne" Hanks. I thought John Wick was a pretty good film, nice to see it getting good reviews from critics, also really excited to see Taken 3 next year. Same here. Happy it's doing well. Keanu is always good.